Fantasy football drafts are interesting and important at all parts. Sometimes the decisions you face in the first few rounds become stressful. In the mid-rounds, you are often drafting for needs. It’s the late rounds though where owners have the chance to throw a few darts. If one or two of those darts lands on a bullseye – championship. Below is a look at players currently being drafted in Round 12 or later or even undrafted in some cases from each of the 16 AFC teams that could pay big dividends. He’s buried on the depth chart but could rise up it quickly if he stays healthy and comes close to the 4.3 yards per carry he averaged as a rookie. Coleman has had a brutal start to his career and the Buffalo offense has serious questions. However, he is still only 24 and should see enough targets for fantasy success. He posted the sixth-most PPR points as the team’s lead back Weeks 14-16, but even with Joe Mixon healthy Bernard will see plenty of action on passing downs. He graded out as PFF’s 10th-best receiving tight end and had the fourth-highest average depth of target (11.6 yards) among all qualifying tight ends as a rookie. Henderson only had nine touches as rookie, but is a wild card in the Broncos’ crowded backfield. He tallied 3,572 yards and 40 touchdowns in 26 games at Coastal Carolina. An Achilles injury is expected to limit Foreman to start the season, but if he gets healthy he’s going to start challenging the inefficient Lamar Miller for touches. All signs point to both Andrew Luck returning and Grant being the WR2 for the Colts. If those factors last for 16 games, it will translate to fantasy success. Bortles hasn’t missed a game in three years and finished as a top-15 QB each season yet he’s QB25 off the board right now. It doesn’t add up. Kareem Hunt is the man in KC, but if he goes down Ware would become RB2 worthy. He is just two years removed from 1,369 total yards on 247 touches. 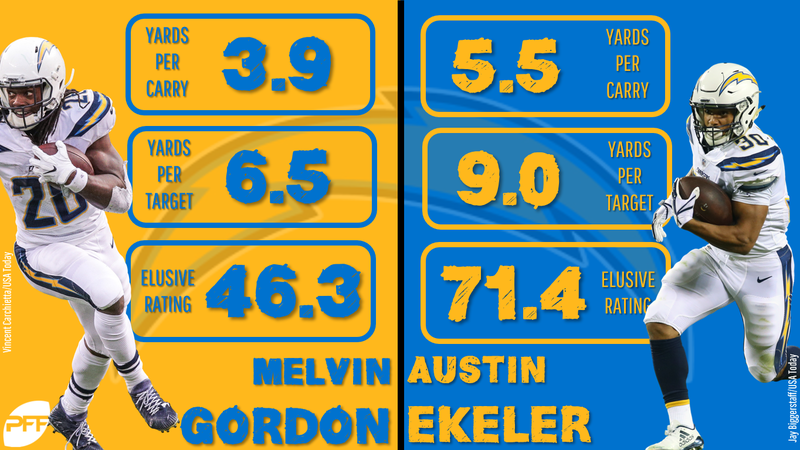 Ekeler scored five times as an undrafted rookie and was more efficient than Melvin Gordon on a play-by-play basis, which should lead to more touches ahead. He’s not a great blocker, but Gesicki’s skills as a pass-catcher make him a viable candidate to see some of the 160 targets left behind by the departure of Jarvis Landry. It’s often hard for fantasy owners to figure out the Patriots’ backfield but the player with the most defined role is White, who reached double digits (PPR) in 10 of 17 contests a year ago. Powell turns 30 in October and is buried behind Isaiah Crowell on the depth chart. However, with 128 receptions over the last three years he won’t disappear altogether. Martin’s 2.9 YPC, 2.2 YAC, and a 16.5 elusive rating in 2017 were putrid, yet Jon Gruden appears to be all in on him. Martin could push Marshawn Lynch for touches. Le’Veon Bell has missed 11 games over the past three years and could bolt in free agency at year’s end, which should lead to Conner getting a crack at some point. The second-year wideout is making the most of his first-team reps with Rishard Matthews dinged. New OC Matt LaFleur is going to get better use out his blazing speed.